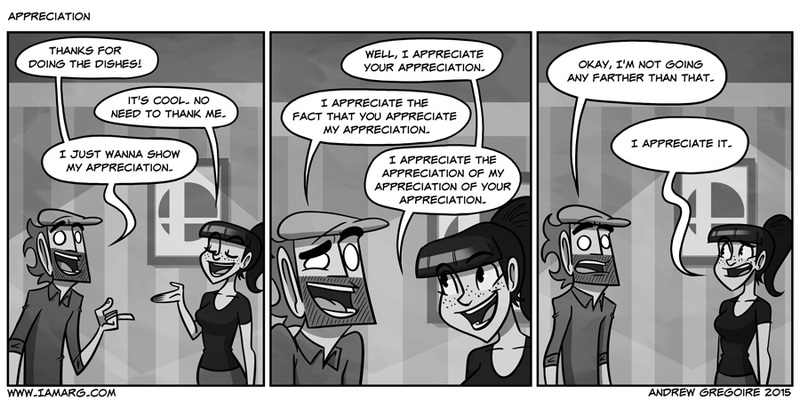 ‘Appreciate’ is a weird word. This is like that horrible cellphone provider commercial from I think at&t but actually funny! Appreciate starts sounding weird after saying it a lot. I’m glad you guys stopped before the headaches set in! Boy, I want a appreciative marriage like yours. I appreciate your appreciation. I guess your appreciation for appreciating appreciation is depreciating. I appreciate you putting up this comic of art appreciating Lynn appreciating the fact he appreciates her appreciating him appreciating her doing the dishes. Combo breaker yet?